Imagine this: you’re an inspired young wizard eager to learn the ways of magic. Before you can undergo your teachings, the sacred texts containing all of your spells you were going to learn were blown away, scattered across the land. Instead of your instructor sending someone much more capable of finding these sheets, he sends you. 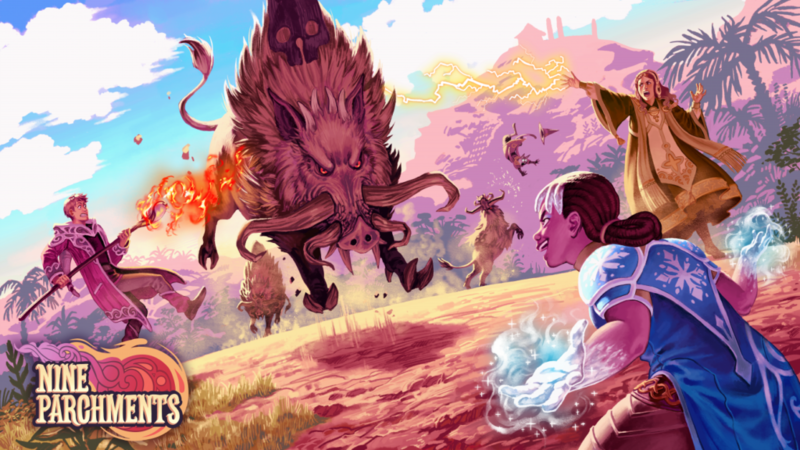 It is very clear from the onset Frozenbyte’s Nine Parchments is a chaotic spell flinging adventure. 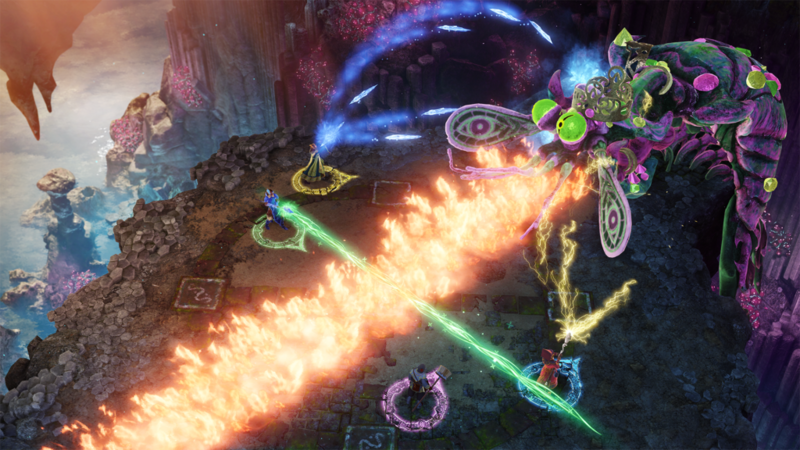 If you played the developer’s previous series Trine you’ll have a little familiarity with Nine Parchments: Levels are linear with drop-in/drop-out multiplayer (now up to 4 can play! ), the visuals are colorful and impressive, each stage has some hidden collectibles to find, and you might not see a solution to a particular section at first, but repeated playthroughs will open your eyes to the solution. It’s all pretty starightforward stuff for a multiplayer action RPG. 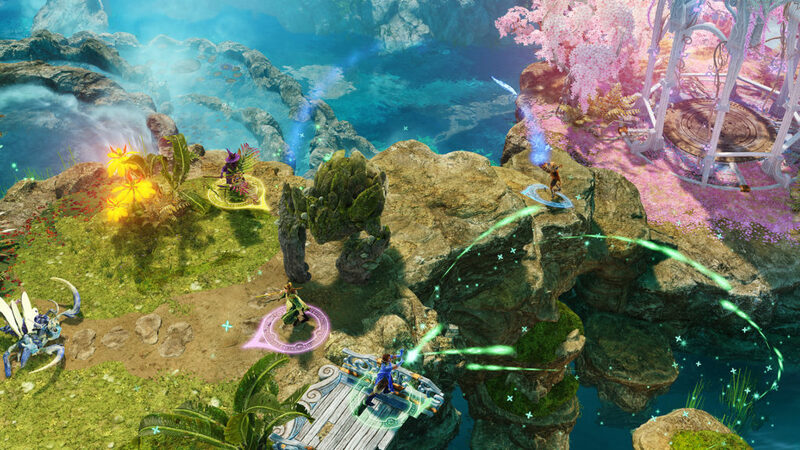 Where Nine Parchments sets itself apart from Trine is the aforementioned spellcasting. There are dozens of spells you can utilize to eliminate your foes, including ice blasts, firey explosions, chain lightning, and elemental traps. There’s quite a variety to the spells, and you’re definitely not going to see them all on just one playthrough. On top of this, spells can be combined with another players’ spells to make something new! If you’re shooting an ice beam and you ally is shooting a dark beam, if you cross the two beams together they’ll combine into an extra powerful, dual elemental spell! Additionally, combining two spells of the same elemental type increases the potency of said element, making dispatching some baddies even easier. In later stages the enemy placement is more demanding, requiring you to *gasp* strategize before engaging. In these moments the game truly shines: one of us leading a charge, calling out their attacks, while the others lay background healing spells, ready to engage when our main needs to fall back. It was fun! The feeling of triumph after completing a particularly difficult section only gets sweeter when a similar encounter comes up later and your group just rolls with it to victory. 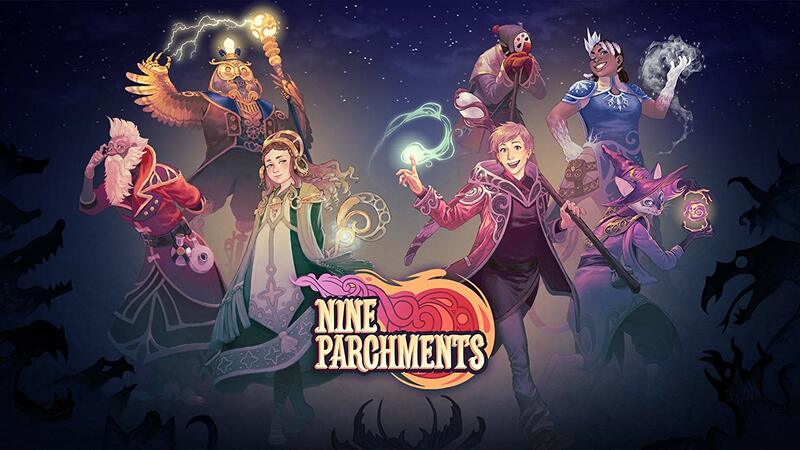 Oftentimes defeating the bad guys isn’t the hardest part of Nine Parchments: It’s the other players. If you have another player (or two, or three) tagging along, watch out for their spells blasting you, because there is definitely friendly fire. If you’re standing in the way of your buddies massive damage dealing fire spell, you’d better bet you’re taking significant damage as well. This leads to a multitude of chaotic moments, which is, albeit, most of the charm of the game. If you have played Arrowhead Game Studio’s Magicka series you’ll know what I’m talking about, because those games and Nine Parchments share many similarities. I feel like Magicka is a bit more in-depth in terms of the spell casting, making Nine Parchments the more “casual” of the two games, to use that term in the most relaxed meaning. Regardless, if you wanted a Magicka 3, this is likely the best you’re going to get for some time. My friend group had a few hilarious nights with this game. I feel like after completing it we likely we play it all too much anymore, not even to unlock additional characters and abilities. I think the game shows you its entire hand a short way in, and if you’re a glutton for challenge then you’ll stay around longer. But if you’re like us you’ll enjoy a few run throughs of stages, get super frustrated at some moments, and then laugh if off when you finish a stage and see you healed the enemies significantly more than you healed your own allies!